If you have been bowling long enough, worked with a coach here and there, listened to enough color analysis by Randy Pedersen on PBA Tour telecasts over the years (or read enough installments of Michelle Mullen and Bill Spigner's bimonthly instructional columns in BJI!) you no doubt have heard at one point or another about the importance of keeping your head as steady as possible throughout your approach and release. That is where Kegel coach Ruben Ghiragossian came in, and an idea was born that may seem crazy to some but, for Pajak, proved to be brilliant. She started wearing a neck brace during practice. 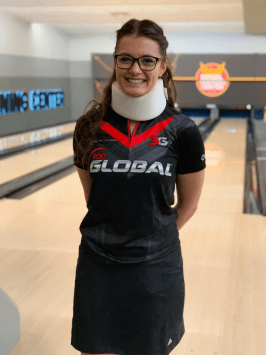 “Using the neck brace came to mind while I was working on increasing my body tilt in my fourth step," Pajak explains. "My coach [Ruben Ghiragossian] made me realize that instead of tilting my body more, I started to ‘head dip.’ I started to practice with [the neck brace] more often and realized it not only helps keep my neck steady, but it also helps decrease the movement right to left while releasing the ball." Is too much head movement at the release your worst enemy, as well? Try wearing a neck brace during practice. If it works for a PWBA Tour Rookie of the Year, it's worth giving it a try during your next practice session.